Scleroglucan is a high molecular weight (>1000 kDa) polysaccharide produced by fermentation of the filamentous fungus Sclerotium rolfsii. Scleroglucan consists of a linear β(1-3) D-glucose backbone with one β(1-6) D-glucose side chain every three main residues. 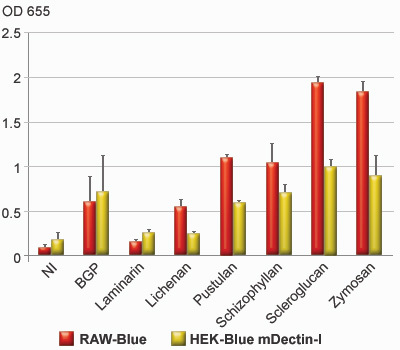 Scleroglucan is recognized by Dectin-1  and strongly activates HEK-Blue™ Dectin-1 and RAW-Blue™ cells. 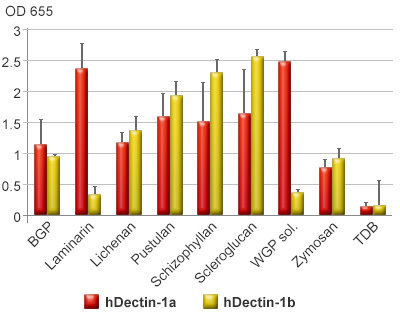 Detection of β-glucans by Dectin-1 receptor leads to the CARD9-dependent activation of NF-κB and MAP kinases . Scleroglucan is shipped at room temperature.